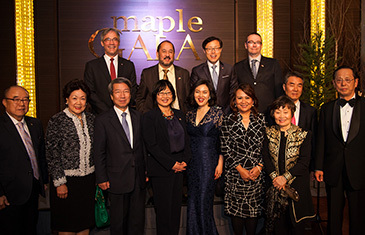 The Canadian Chamber of Commerce in Korea (CanCham Korea) hosted its annual Maple Gala on the evening of March 21, 2014 at the Banyan Tree Club and Spa in Seoul. More than 200 guests from Canada and Korea attended the black tie affair. They included Canadian Ambassador to Seoul David Chatterson, Chairwoman Genny S. Kim of Canadian Chamber of Commerce in Korea, Sen. Yonah Martin from British Columbia, and former Korean Prime Minister Chung Un-Chan . “We sincerely thank you for many attendances including general manager of Air Canada Young Lee, President Amy Jackson of American Chamber of Commerce in Korea, president Kim Hang-Kyung of Korea-Canada Society, etc.” said Genny Kim, canCham Chairwoman. She said as well: Additionally another special thanks to sponsors such as Air Canada, Bombardier, Jouviance, LG Electronics, Shin&Kim, Natural Factors, etc. Upon recently-concluded FTA between Korea and Canada from her standpoint as CanCham chairwoman, she mentioned that the Korea-Canada Free Trade Agreement would bring bilateral dynamic growth for the business communities of the two countries. Starting his welcoming remarks with comments regarding the 50th anniversary of diplomatic ties between Korea and Canada last year which were filled with many commemorative events, Amb. Chatterson said: “Bilateral relations have blossomed over the last 50 years, grounded in our strong political and economic partnership and cooperation." "With more than 50 years of diplomatic relations between Canada and South Korea, a free trade agreement is the natural next step in a dynamic relationship between two nations committed to economic growth and development through free trade,” the Canadian envoy said. "I am very pleased to see more increasing partnerships with Canadian Chamber of Commerce in Korea like tonight's event, hoping continuing friendship between the two countries and for the CanCham members to enjoy good food and wine during the function all the time," he added. After Amb. Chatterson’s welcoming remarks, special screening "The Feast of Aurora" by Astro-photographer O-Chul Kwon provided participanting guests with fantastic aurora scenes of Canada. By her toast, Sen. Yonah Martin from British Columbia, Canada who was on hand, also congratulated Korea-Canada FTA conclusion as a milestone to pave the way for the prosperity between the two countries. Canada-born new age pianist Steve Barakatt enthralled guests with his sweetish special performance including Rainbow Bridge Story. Last but not least, lucky draw and cocktail hour by SKYY became pleasant times to enhance amusement and to harden friendship between chamber members until the Maple Gala was finalized by late night. The Canadian Chamber is a non-profit organization dedicated to nurturing a strong Canadian community in Korea and to promote Canadian business interests. Founded in 1995, the Chamber opens its membership to Canadians and Koreans alike. It organizes a number of fun and informative networking and social events each year, while also advocating on behalf of the Canadian business community and in close collaboration with the Canadian Embassy on a range of issues.